"They loved you unlimited" Sri Lanka "Student Heroes Day" 2014 commemoration was held at University of peradeniya yesterday. 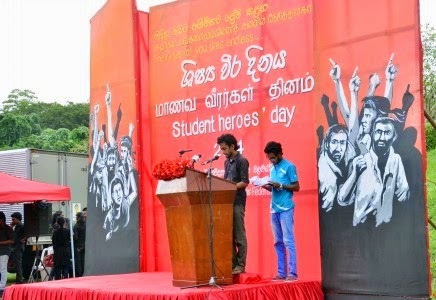 The National Student Heroes’ Day commemorated every year on 20th June. Comrade Nishanthe Jayawardene of Vijithe MMV, Dickwella was shot dead within the school premises on 20th June, 1988. June 20th is declared the ‘National Student Heroes Day’ basing on these incidents. ඔවුහු ඔබට අසීමිතව පේ‍්‍රම කළහ’ ශිෂ්‍ය වීර දිනය 2014 සැමරුම් උළෙල අද දින(20) පේරාදෙණිය විශ්වවිද්‍යාලයේදී පැවැත්විනි. මේ සඳහා විශ්වවිද්‍යාල ආචාර්යවරුන්, සිසුන් ඇතුළු විශාල පිරිසක් සහභාගී වී සිටියහ. මෙය 29 වන ශිෂ්‍ය වීර දිනය වේ. සවස 04.30ට ආරම්භ වූ ප‍්‍රධාන සැමරුම ආරම්භ වූ අතර එහිදී විරු සිසු සමරු ගී ප‍්‍රසංගයක්ද පැවැත්විනි. තවද දිනය පුරා ශිෂ්‍ය ව්‍යාපාරයේ ඉතිහාසය විදහාදැක්වෙන ප‍්‍රදර්ශනයක් පැවැත්විනි. සමරුවේදී පේරාදෙණිය විශ්වවිද්‍යාලයේ ආචාර්ය ලියනගේ අමරකීර්ති අදහස් දැක්වූ අතර සමරු දේශනය අන්තර් විශ්වවිද්‍යාලයීය ශිෂ්‍ය බලමණ්ඩලයේ කැඳවුම්කරු නජිත් ඉන්දික විසින් පැවැත්වූහ. සියළු විශ්වවිද්‍යාල නියෝජනය කරමින් සිසුන් විශාල පිරිසක් මේ සඳහා සහභාගී වී සිටියහ. Today (20th June) is the National Student Heroes Day’ that commemorates student comrades who sacrificed their lives on behalf of the Motherland and free education. Shooting dead comrade Weerasuriya on 12th November, 1976 at Peradeniya University was the first student life taken by capitalist governments in Sri Lanka. Since then this repression has been continuing and the latest is the brutal killing by the police of Comrade Susanthe Bandara at Ruhuna University in July, 2010. The history of the student movement in Sri Lanka is the history of the struggle for the independence of the Motherland and for free education. In this struggle 20th June is a very special day. For the first time in the world a police station was established in a university and in the struggle against the UNP repression Comrade Padmasiri Abeysekera was murdered on 19th June, 1984. In a police shooting at a student agitation held in Colombo University protesting against this murder Comrade Rohana Ratnayake was killed on 21st June1984. Also, Comrade Nishanthe Jayawardene of Vijithe MMV, Dickwella was shot dead within the school premises on 20th June, 1988. June 20th is declared the ‘National Student Heroes Day’ basing on these incidents. Most of student murders in Sri Lanka took place during the latter years of the 80s. 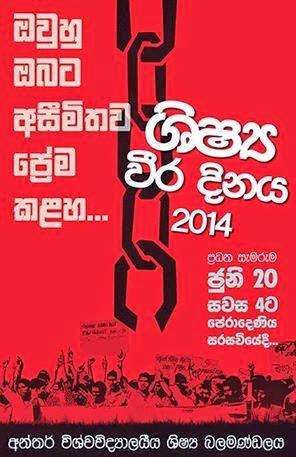 This was when student movement in Sri Lanka was fighting against privatization of education, Indian expansionism as well as dictatorship and undemocratic nature of J.R. Jayawardene. Even today the same process of undemocratic moves, attempt to privatize education and cowing down to imperialism and regional hegemony is taking place under different administrations and persons. The symbol of destruction of free education then was the Colombo North medical school that was launched with the courtesy of the UNP government. Today Malabe medical school is being implemented with the full support of the Alliance government. Then our Motherland was swallowed up by Indian expansionism through Indo-Lanka pact and IPKF. Today our country is being gobbled by the US imperialism through ACSA agreement, the IMF and World Bank and Indian expansionism through, with or without, SAFTA and SARTIS agreements. Then J.R. Jayawardene’s constitutional dictatorship destroyed democracy in the country deploying official and unofficial armed gangs. Today democracy is being destroyed adding family dictatorship to the constitutional dictatorship of JR and also with official and unofficial armed gangs.